Title: The Door of No Return. Sixteen-year-old Zac never believed his grandfather's tales about their enslaved ancestors being descended from an African king, but when his grandfather is murdered and the villains come after Zac, he sets out for Ghana to find King Baktu's long-lost treasure before the murderers do. 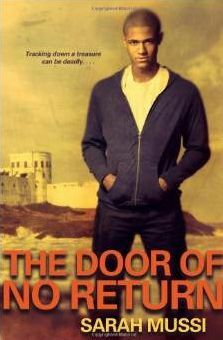 The Door of No Return is a novel aimed at young adults. It is structured vaguely as a diary of the events that surround its protagonist, Zac Baxter, paralleled by excerpts of the slave narrative of his ancestor Bartholomew Baktu some three hundred years before. The plot of the novel sends Zac from the UK in search of his ancestor’s buried treasure and his own heritage in coastal Ghana. Neither of these characters in entirely believable – Bartholomew’s narrative is entirely unlike any of the accounts left by enslaved Africans and Zac’s attempts at Gloucestershire street lingo seem a bit forced. Nevertheless, the literary device of paralleling the stories of the two is effectively played out and the modern-day Baxter an enjoyable hero and one designed to capture the attention of cell phone-toting young readers. both in the slave trade and in the modern conspiracy to chase Zac down. to an island in the Pra River. The other is justice, in the form of a bond allegedly written by British officials promising not to enslave the Baktu and which, if it can be brought to light by Zac, can win millions of pounds in reparations for their descendants in Africa, the Caribbean, and the UK. when it is really a work of heritage that has admittedly been reworked to suit her objectives. The fact is that the novel liberally cuts and pastes historical event in pursuit of contemporary goals. As a novel it has the capacity to interest young people in modern transnational identities like Zac’s and in Africa as a complex, multifaceted and interesting place. The author should be congratulated on her ability to help readers question their assumptions in this regard. In dealing with the past, it descends sometimes into crude characterizations of good and evil and anachronistic depictions that are appropriate in a literary genre such as this one but not necessarily in depicting historical processes. This is not to say that the book isn’t a worthy read. I will be passing it on to my children, certainly. But it does leave me wishing for a more thoughtful consideration of the meanings of the slave trade that relies less on flashy and well-worn symbols like doorways of no return and lost princes of Africa and more on complex and rich depictions of past peoples and events.